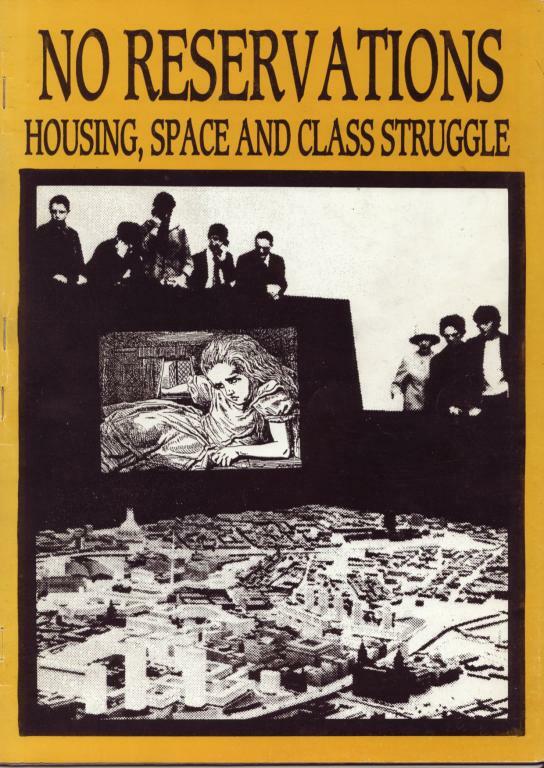 The Red Menace reviews No Reservations: Housing, Space and Class Struggle. "More and more the city is a monolithic temple to the power of money over us, as the pyramids were to the power of the pharoahs over the slaves- and like the servants of the pharoahs, we are buried alive inside it." The articles in No Reservations (from which the above quotation is taken) look at some of the ways in which the logic of capital shapes the housing situation and other aspects of social space. Recent changes in housing in Britain are discussed, as is the historical development of the city, the role of art in relation to gentrification and the state’s hostility to unofficial social gatherings (as shown by the suppression of the Stonehenge festival in 1985). One article, published originally in the U.S. journal Midnight Notes, looks at the U.S. government’s "spatial deconcentration" programme. This was developed in the aftermath of the 1960s riots in American cities, with the aim of breaking up the large concentrations of the inner city poor (especially black people). In Washington DC for instance, 50,000 people a year were being displaced from the inner city to isolated suburbs during the 1970s, encouraged by the carrot of rent subsidies for suburban housing and the stick of deliberately running down inner city dwelling space. As our struggles in the past (such as inner city riots) have shaped capital’s present strategy for dealing with social space, so this strategy too will generate new struggles. No Reservations examines some recent struggles over housing and social space, such as the Zurich riots of the early 1980s (focused around the demand for an autonomous youth center), the August 1988 anti-gentrification riot in Tompkins Square, New York, and last year’s squatters’ resistance to evictions on the Stamford Hill Estate in North London. Although the pamphlet focuses particularly on the Western ‘developed world’ it is clear that the struggle is a global one. In the Kurdish region of northern Iraq for instance, troops have begun the forcible evacuation of 250,000 people. The entire population of the town of Quala Diza (100,000) have been deported and their homes reduced to rubble. In Romania meanwhile 7000 villages are to be obliterated and the dispossessed peasants resettled in new towns in the course of the state’s ‘sistematizarea’ programme. The aim here is not simply to modernize agriculture, but also to increase social control through the destruction of remote villages at present relatively free from state surveillance. In the few remaining corners of the globe not yet completely colonised by capital, the struggle over space also takes the form of a fight to preserve a way of life that is not completely dominated by money. In this context we could mention the Kayapo Indians’ fight against the destruction of their home: the Amazon rainforest. While trendy rich popstars like Sting give their worthless ‘support’ to the Kayapo Indians in their opposition to hydroelectric dams however, they keep silent about the flooding of the urban jungle with wine bars, office blocks and housing developments for the wealthy. Those of us natives facing deportation from the inner cities to reservations in Essex and elsewhere need to mobilise our own tribes in opposition. Reading No Reservations will give us a better understanding of the terrain on which we are fighting. No Reservations is available from News from Everywhere, Box 14, 136 Klngsland High Street, London E8 (£1 + SAE).